Art(ists) on the Verge @ Spark Festival from Steve Dietz on Vimeo. Conductive materials such as inks, threads, and textiles are opening up a whole new world of possibility for crafting electronics into fabric. 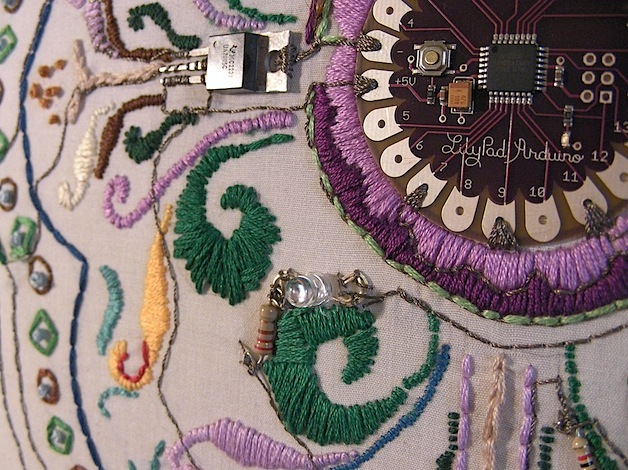 Circuits can be hand- or machine-sewn, woven, embroidered, inked, or knit. Leah Buechley, creator of the LilyPad Arduino and head of the High-Low Tech group at the MIT Media Lab, published : LilyPad in the Wild: How Hardwareʼs Long Tail is Supporting New Engineering and Design Communities. Smart Materials Kit in Maker Shed. For more do-it-yourself ideas, be sure to visit the Craftzine Soft Circuits archive. Animator Andrew Park illustrates Denis Dutton’s Darwinian theory of beauty. Chris is a working film-maker, in the midst of post production on “Revenge of the Electric Car” in Hollywood. This is an excellent opportunity for students to learn about the art of filmmaking.